OBJECTIVES: The primary aim was to assess the need for objective cuff pressure monitoring in the theatre complex and trauma centre at Groote Schuur Hospital, Cape Town, South Africa. Secondary aims were to determine whether the tube size, tube make or place of intubation affected cuff pressure. METHOD: Endotracheal tube cuff pressures of 91 patients in the trauma centre and 100 patients in the theatre complex were randomly measured using a Mallinckrodt cuff pressure gauge. The measurements were recorded on a standardised data sheet and transferred to an electronic database for analysis. RESULTS: There was a significant difference between cuff pressures in the trauma centre and those in the theatre complex (p<0.001), the means being 55 cmH2O and 25 cmH2O, respectively. The site of intubation had a significant (p=0.001) effect on cuff pressures, with mean pressures as follows: on scene - 71 cmH2O; referral hospital - 57 cmH2O; and Groote Schuur trauma centre - 42 cmH2O. Only 30% of cuff pressures measured in the trauma centre were below 30 cmH2O, and, alarmingly, 17% were between 91 and 120 cmH2O. In the theatre complex, 77% of cuff pressures were in the acceptable range. Digital balloon palpation corresponded poorly (correlation coefficient 0.47) with measured cuff pressure, and statistical analysis showed that it tended to underestimate the pressure at higher cuff pressures. CONCLUSION: The risk of a high cuff pressure is roughly two- to threefold higher in emergency patients than in theatre patients. These unacceptably high cuff pressures are especially concerning in view of the fact that many trauma patients are hypotensive and therefore more susceptible to mucosal ischaemia. Endotracheal intubation is associated with varying degrees of tracheal injury. Autopsy studies have shown that maximal damage always occurs at the site of the cuff. '11 An over-pressurised endotracheal cuff impairs mucosal blood flow, causing ischaemia. '3-The recommendation arising out of this study was that cuff inflation pressure should not exceed 30 cmH2O. Early pathological changes are superficial tracheitis and fibrin deposits to shallow ulcerations overlying the anterior portion of the cartilaginous rings. The size and extent of the ulcers increase with time, leading to exposure of the cartilaginous rings. Softening, splitting and fragmentation of the cartilage follow at a later stage. Many studies have shown that digital balloon palpation corresponds poorly with the actual measured endotracheal cuff pressure. '4-11-Despite this evidence, endotracheal cuff pressure manometers are not readily available in the theatre complex at Groote Schuur Hospital (GSH), Cape Town, South Africa (SA), and there are no manometers available in the trauma and emergency departments. Considering the high rates of trauma in SA, it is important to prevent iatrogenic complications in these patients. To our knowledge, no studies have measured endotracheal cuff pressures in trauma or emergency patients in SA. The purpose of this study was to evaluate cuff pressures in the GSH trauma centre and theatre complex and to assess whether objective monitoring of cuff pressures with manometers is warranted. Secondary outcomes were whether the tube make or size and the place of intubation affected cuff pressure. An audit was conducted over a 4-month period at GSH. The audit consisted of 91 intubated patients in the trauma centre and 100 intubated patients in the theatre complex. They were randomly selected and their cuff pressures were measured by a single investigator to decrease inter-user variability. A minimum sample size of 16 patients per group was calculated to achieve 91% power to detect a difference of 30.0 between the null hypothesis (that both group means are 55.0) and the alternative hypothesis (that the mean of group 2 is 25.0), with known group standard deviations of 33.0 and 15.0 and with a significance level (alpha) of 0.05000, using a two-sided Mann-Whitney test assuming that the actual distribution is uniform. We used a larger sample size because we wanted to perform sub-group analyses. All data collected were recorded on a standardised datasheet and transcribed to an electronic database for analysis. Cuff pressures were measured using a Mallinckrodt cuff pressure gauge, for which themaximum recordable pressure is 120 cmH2O. All the patients with cuff pressures documented as 120 cmH2O had initial pressures that were unrecordably high on the manometer. In the trauma centre, any patient who was intubated before arrival or at the centre was eligible for inclusion in the study. Patients requiring re-intubation were not included. The endotracheal cuff pressures were measured and adjusted to an appropriate pressure, if indicated. The place of intubation was documented as follows: on scene, at a referral hospital (level 1 or 2 hospital), or at the tertiary hospital (GSH). Because the intubator was often not present, no attempt was made to compare the measured pressure with a qualitative pressure. In the theatre complex, patients were included in the study if they were intubated in the theatre complex and did not have a tracheostomy in situ. Patients undergoing both elective and emergency procedures in all surgical disciplines were included. Although this was not documented, we tried to exclude patients who were ventilated using nitrous oxide. Other parameters documented were the endotracheal tube make and size. No personal information was recorded, ensuring patient confidentiality. The anaesthetists were required to provide the number of years they had spent in the discipline and asked to estimate the cuff pressure by digital balloon palpation prior to cuff pressure measurement. The cuff pressures were then adjusted, if necessary, to appropriate pressures. No attempt was made to blind the anaesthetists from the study. For 16 of the theatre patients, the anaesthetists specified only the number of years that they had been a consultant or registrar and not the total number of years they had been doing anaesthetics. To align this with the rest of the data, it was assumed that they all had 1 year of medical officer training before specialising, and that the consultants had 4 years of registrar training. The total number of years in the discipline was then calculated. We do not consider that this affected the results. All statistical analyses were performed using Stata version 12 (StataCorp, USA). Continuous variables were assessed for deviation from normality using the Shapiro-Wilk test and visually by histograms. The Wilcoxon rank-sum test was used to compare median cuff pressures in two groups, while the Kruskal-Wallis one-way analysis of variance by ranks was used to compare median cuff pressures in more than two groups. Spearman's correlation coefficient was used to estimate the correlation between estimated and measured cuff pressures. Bland-Altman plots of the mean against the mean difference were used to examine the agreement between measurements. A prevalence ratio was used to explore the magnitude of the relationship between the trauma centre and theatre cuff pressures. The two highest cuff pressure categories were combined for this calculation, because there were no patients with cuff pressures of 91 - 120 cmH2O in the theatre group. Statistical significance was set at p<0.05. Ethical approval for the study was obtained from the Ethics Committee of the University of Cape Town. Of the 191 patients initially included in the study, 4 were excluded from the analysis. Of these, 3 were from the trauma group and 1 was from the theatre group. Of the trauma patients, 2 had low cuff pressures because the cuff had burst, and the 3rd patient's cuff was filled with water after transfer by aeroplane. The theatre patient had a cuff pressure measuring 0 cmH2O. It was uncertain whether this was a technical fault. In the theatre group, anaesthetist experience was categorised into three groups: 1 - 5, 6 - 10 and >11 years of experience. One anaesthetist refused to estimate the cuff pressure, so a further 2 patients were excluded from the analysis. There was poor correlation between the estimated and measured cuff pressures (correlation coefficient 0.47). The Bland-Altman plot showed that at low cuff pressures the level of agreement between the estimated and measured cuff pressures was good. As mean cuff pressures increased, agreement was clearly poorer, with more points falling outside the limits of agreement. At high cuff pressures, digital balloon palpation underestimated the cuff pressures. There was no significant difference in cuff pressures between the three anaesthetist experience groups (p=0.9). The median cuff pressure in the theatre patients was 20 cmH2O and that in the trauma patients was 47 cmH2O (Wilcoxon Mann-Whitney test z=6.925, p<0.001. A histogram portrays the cuff pressures as percentages (Fig. 1). In the trauma centre, the median cuff pressures for each place of intubation were as follows: on scene - 71 cmH2O; referral hospital - 54 cmH2O; and GSH - 30 cmH2O. These differences were statistically significant (p=0.001) (Table 1). All 186 patients were categorised according to cuff pressure. 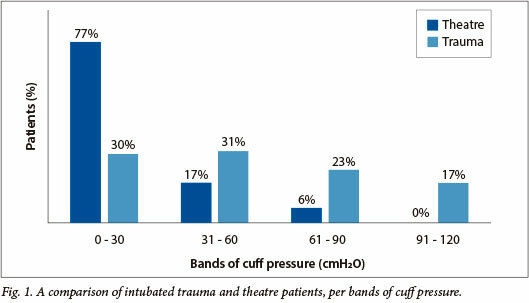 Of the 103 patients with cuff pressures less than 31 cmH2O, only 26% were from the trauma centre. The risk of high cuff pressures of 31 - 60 cmH2O and 61 - 120 cmH2O is roughly two- and threefold higher, respectively, in trauma patients. Each of these risks is statistically significant. Secondary objectives were whether the tube make or size affected the cuff pressure. For these analyses, a further 16 data points were removed from the theatre group because these variables were not recorded. Endotracheal tubes sized between 6 mm and 8.5 mm were evaluated. For statistical purposes, the tube sizes were ordered into 3 groups: 6 - 7 mm, 7.5 mm and 8 - 8.5 mm. Within this range, tube size did not significantly affect the cuff pressure (p=0.8). The two brands of endotracheal tubes compared were Mallinckrodt and Rusch. No significant difference in cuff pressures was found between the two brands (p=0.4). Damage to the trachea during intubation is inevitable as a result of the contact between the endotracheal tube and the trachea. Many studies show that digital balloon palpation corresponds poorly with the measured endotracheal cuff pressure. [4-8,10,11] One large study also found that anaesthetist experience corresponds poorly with measured cuff pressures. In the same study, patients whose cuff pressures were measured and adjusted with a manometer had a significantly lower incidence of post-procedural sore throat, hoarseness and blood-stained expectorant. Fibre-optic bronchoscopy confirmed that both the control group and the study group sustained mucosal damage; however, the mucosal injuries in the control group were more severe. In our study, the mean cuff pressure in the theatre group was 25 cmH2O. Although this is acceptable, 23% of the theatre patients had cuff pressures greater than 30 cmH2O and 6% had pressures between 61 and 90 cmH2O. The highest recorded cuff pressure was 80 cmH2O. In a controlled environment such as anaesthesia, no cuff pressures should fall within this range. We found a poor correlation between estimated (by digital balloon palpation) and measured cuff pressures (0.47). At low cuff pressures, the estimated and measured pressures fell within the limits of agreement, but at high cuff pressures, digital balloon palpation underestimated the pressures. This is an important finding, because patients with high cuff pressures are most at risk of developing tracheal stenosis. There was no significant difference (p=0.9) between the experience groups, demonstrating that experience as an anaesthetist does not improve the accuracy of digital balloon palpation. Our results showed a significant difference between cuff pressures in the theatre complex and the trauma centre (p<0.001). The mean cuff pressure in the trauma centre was 54 cmH2O, with 9 patients having cuff pressures above 120 cmH2O. Only 30% of the patients had cuff pressures below 30 cmH2O, and, alarmingly, 40% had cuff pressures between 61 and 120 cmH2O. We found a two- to threefold increased risk of high cuff pressures in emergency patients compared with patients who were intubated in a controlled theatre environment. The cuff pressures in the trauma centre were worryingly high, especially in view of the fact that many trauma patients are hypotensive. A major cause of tracheal morbidity is that the pressure exerted by the endotracheal tube cuff exceeds the capillary perfusion pressure, causing ischaemia. In hypotensive patients, the capillary perfusion pressure is lower and therefore obstructs at lower cuff pressures. Attention needs to be drawn to the dangers of high cuff pressures at all levels of health care, and prehospital personnel and emergency room doctors should begin routinely monitoring endotracheal cuff pressures upon intubation. We found that, within the range of endotracheal tubes sized between 6 mm and 8.5 mm, tube size did not significantly affect cuff pressure. This is in keeping with a previous study that documented cuff pressures in the prehospital setting. Limitations of this study include that it was conducted at a single centre, it was not a blind study, and some anaesthetists might have contributed more to the study than others. Endotracheal tube cuff pressures in the trauma unit and emergency setting are unacceptably high. This is of particular concern because many of these patients are hypotensive and therefore particularly susceptible to mucosal ischaemia. The theatre complex could benefit from cuff pressure monitoring in view of the fact that digital balloon palpation corresponds poorly with the cuff pressure and underestimates cuff pressures at high cuff pressures. Cuff pressure monitoring is simple and inexpensive, and it is essential that cuff pressures be measured upon intubation and checked regularly. Acknowledgements. We thank Proff. A Nicol and P Navsaria of the Groote Schuur Hospital Trauma Centre and the Groote Schuur Department of Anaesthetics for allowing us to conduct the audit.